Robyn, you just make me do it-- The math that is! My first thought about the squares was-20 X 20 inches. OK, that's do-able. Then I thought again, and realized—20 X 20! Why that's like knitting the back of sweater! Its a lot of knitting (or crocheting, since I did do a 20 X 20 block, too). So Block 1 (a giant granny square) is done. (no new photo—it looks just like it did a few days ago, but its a bit bigger) Block 2? not quite half done. Though at first glance it might not look it. I did a swatch—but like all swatches, it lied, and this block is slightly bloated—and will be generous (21 X 21) and a bit over sized. I cast on 80 (for 1 side)stitches and 80 again, and a Plus 1 for the miter point. This has created a 5 inch L shaped band. 5 inches of a 20 inch square sound like I am about 25% done, right? Wrong actually. Because I am no longer knitting a 20 inch square. I am now knitting a 15 inch square! So let's do some simple math-- area. You remember Area= L(ength) X W(idth), right? That's what I had to knit to start. Now, after 5 inches of work, I have a 15 X 15 inch square left to knit. The area left is 225! Almost half the area I need to knit has been done. I am almost half done! Every row is getting shorter, and easier. The next 5 inches of work will make the square of 10 X 10 left to do. The area for a 10 X 10 square is 100—the square will be 75% done. With every row, the work is exponentially smaller. Each row will be shorter and shorter and progress will fly! The last 5 inches? They are a mere 3 % or so of the area. A snap! Work the math the other way (5 X 5=25, 10 X 10=100, 15 X 15 =225, 20 X 20 =400—and you can begin to understand hurricanes or earthquakes, or tornado's--and how a level 2 (what ever) is so much worse than a level 1. A level 1 is like the 5 X 5 square, a level 2 is like the 10 X 10 square.. and so on. (See knitting can be used to teach anything!) We all know how tedious the end rows or round of a large item can be... It's not something we imagine! Things don't just simple grow bigger--they grow bigger exponentially! My contribution is just a drop in the bucket of the 1500 squares Robyn needs. Let's see, 1% of 1500 is 15. (3 Squares are a lot less than 1%.) 7 and half squares are 0.5%. 3 squares are less than that! (a bit less than a puny 0.25%!). But like any big project, every square, every 0.25% counts. There's time, you could still make a square—just one—and it would be a 0.15% of the project. And EVERYTHING! 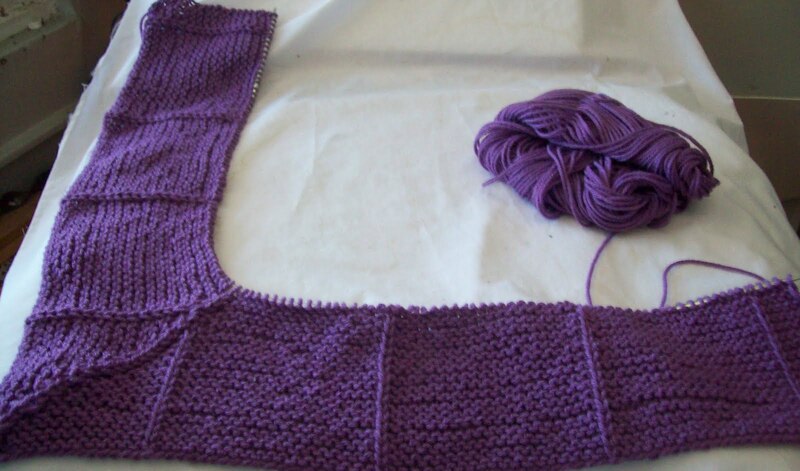 Robyn has a Ravelry group—join and make a square. Become a drop in the bucket—until it overflows! The thing about this project is every square matters. Like rain drops—each single drop is so inconsequential. But when they come down all together—Floods! Oh, yeah, did I mention? Robyn is making each square contributed a raffle ticket.. You could win a skein of her homespun art yarn! Ok - you sold me! I'm going to make a square RIGHT NOW! PS. And I even understood most of the math!